With slightly different characteristics from what you'd call an idol, these two talk about their view on idols. They tell us about what they think of their positions over these 10 years. It may be quite a sudden leap to start our discussion off like this, but everyone says that the two of you seem like the most likely people to be the first to get married in your own respective groups (laughs). Okai: Is that so (laughs)? But I feel that Risako will get married before me. Sugaya: Isn't there a pattern where everyone says that, but it actually ends up with that person being the last to get married (laughs)? Okai: In 10 years time, we'll be almost in our thirties, and most people at that age will normally be married, so I'd like to have gotten married by then. Sugaya: Since you have lots of siblings, I feel like you'll become a Mama with lots of children. Okai: I feel like we'll mingle as fellow mothers. All of us with children will gather together. Sugaya: But amongst the members of my group, Captain will definitely be late. Okai: I feel that Miyabi-chan will somehow or the other be late as well. As for Kumai-chan, I feel like she on the other hand might get married before we know it. 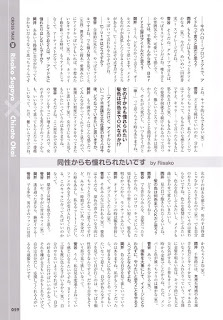 Sugaya: I think that if someone's going to get married out of the blue, it'd unexpectedly be Momo (laughs). I think that Kumai-chan will be really late. I've been together with her all the time, so I know her, and Kumai-chan is the type of person that thinks very carefully. It would worry me if she rushed. I'd be shocked if Kumai-chan got married before me (laughs). Okai: I feel that ℃-ute's Yaji will unexpectedly get married early. I feel that we'd be be fine with Yaji getting married, and that we'd start saying things like 'It's about time to think about marriage'. What are their thoughts on what a proper idol is? Thank you very much for the analysis (laughs). Talking about marriage, we started on a topic that in a way is a taboo discussion for idols, but I think if it's the 2 of you, the fans will be able to read this without suspicions. Okai: That does seem so (laughs). Sugaya: I really get what you mean (laughs). While I don't think that this is a truly a necessity for an idol, but for both Risako-chan and Chisato-chan, is the fact that you're idols, that you should act as idols, is that something that you now keep actively in mind? Okai: I think that I'm not an idol. Like, that isn't what I'm most suited to. At the 'Hello! Project Kids Audition', I did things like 'Gets!' and 'Sanpei de~su', isn't that different (laughs)? At the time, it was fine to do impersonations. Even amongst my fans, few of them see me as an idol. 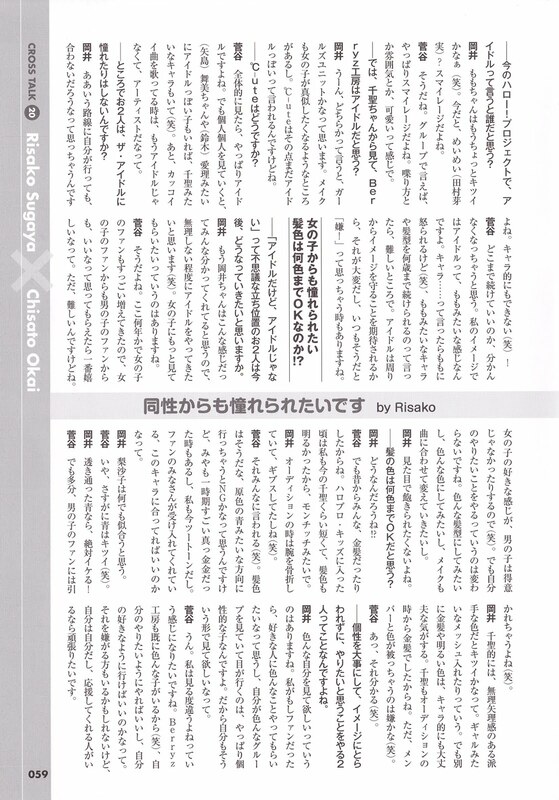 Sugaya: I liked singing from the start, and being a child, I liked Yaguchi Mari-san, who sang Mini Moni。's songs, so I took the audition without caring whether I passed or not. 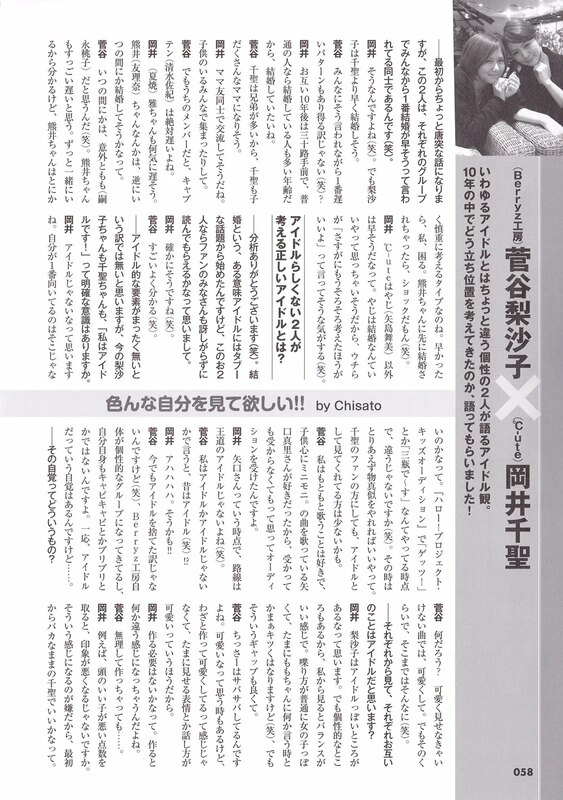 Okai: At the time, Yaguchi-san wasn't your run-of-the-mill idol either (laughs). Sugaya: If you were to ask me whether she was or wasn't an idol, I guess I'd have to say that she was an idol back then (laughs)!? Okai: Ahahaha. That might be the case!! What sort of thing is that self awareness? Sugaya: Let me see... At songs where I've got to be cute, I'll be cute. But I won't really go that far, not to that extent (laughs). Looking at one another, do you think of one another as idols? Sugaya: Chissa, you're frank. There are times when I think you're cute, but it's not like it's a cuteness that's done on purpose, it's an occasional glimpse of a cute expression on your face or how you talk. Okai: There's no need to do it purposely. If you try making it up, it'll end up feeling weird, right? Okai: For example, it leaves a bad impression if a clever girl scores bad marks, right? Since I'd hate it if things ended up like that, I thought that it would be fine if I just stayed an idiot from the very start. In the current Hello! Project, who do you think of as being an idol? Okai: In a matter of time, it'll be tough for Momo-chan (laughs). At the moment, MeiMei (Tamura Meimi)? It'd have to be S/mileage. Sugaya: Yeah. As a group, it'd have to be S/mileage. The way they speak, their atmosphere, they're adorable. 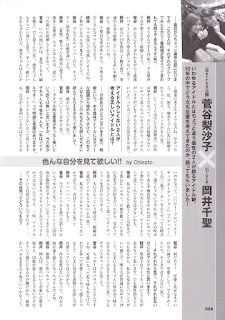 Well then, Chisato-chan, from your eyes, do you think of Berryz Kobo as idols? Okai: Hmm, if I had to choose, I'd say that they're a girls unit. Like girls would want to copy how Berryz apply their makeup. On that point, ℃-ute are told that we're still idol-like. Sugaya: Looking at them as a whole, they're definitely idols. But looking at them individually, there are idol-like girls like (Yajima) Maimi-chan and (Suzuki) Airi, but there are characters like Chisato as well (laughs). Also, when you're singing cool songs, you're no longer idols, you're already artistes. By the way, would the 2 of you not like to be admired as idols? Okai: Even if I went down that route on my own, I don't think that it would fit. Even personality-wise, I can't do it (laughs)! Sugaya: I think I'd have no idea how long I'd need to continue on with it. In my mind, an idol would be like Momo. A character... Well, Momo'd get mad if I said that (laughs), but if I were to keep up a character and hairstyle like Momo, keeping at it no matter how old I got, it'd be difficult. Since there's this external expectation that idols will maintain their image,it'd be tough, and there are times when I think that it'd be unpleasant to always be like that. What is the limit of OK hair colours!? The 2 of you are in this strange position where you're idols, but not idols. In the future, how would you like to be? Okai: I think that everyone already knows that Okai-chan is like this, so I think I'll be an idol without forcing myself too much (laughs). I'd also like to be watched more by girls. Sugaya: That's right. These past few years, the number of female fans has greatly increased, so what would make me happiest is if we could bring enjoyment to both female fans and male fans. But it's difficult. Since what the girls like aren't necessarily the guys' forte (laughs). But I'll do what I want to do, that won't change. I'd like to try out all sorts of hairstyles, I'd like to try out all sorts of colours, and I'd even like to change how I do my makeup depending on the song. Okai: You don't want to get tired of your own looks, right? As for hair colours, what colours would be OK? What's the limit? Sugaya: But in the past, we have gone blonde. When we joined the H!P Kids, my hair was about as short as Chisato's currently is, and I'd bleached my hair, I looked like Mochichi. Okai: At the auditions, you had a broken arm, in a plaster cast (laughs). Sugaya: Everyone mentions that (laughs). It's the same with hair colour, I think that heading towards striking colours like blue would be a no-go, but there was a time when Miya was completely blonde, and my hair is currently two-toned. The fans accepted it, and maybe it's fine if it goes with our personalities. Okai: I think that anything goes with Risako. Sugaya: Nope, blue would definitely be tough (laughs). Okai: A transparent blue would definitely go swimmingly! Sugaya: But the male fans might draw back though (laughs). Okai: For me, flashy colours that feel forced would be difficult. Like if I streaked my hair like a gyaru. But I feel that blonde or bleached hair would be fine, personality-wise. Since even from the auditions, I'd been blonde. But I'd hate to have the same hair colour with another member (laughs). Sugaya: Ah, I get what you mean (laughs). Treasuring your uniqueness, not being enslaved by your image, the 2 of you do what you want to do. Okai: I do want to see various aspects of my own self. If I was a fan, I'd would like the person I like to do all sorts of things. And when I watch various groups, my eyes will definitely be drawn to the individualistic girls. So I want to be seen in that way as well. Sugaya: Yup. I'd like it to be that I'd look different every time you saw me. Since Berryz Kobo already has all sorts of girls (laughs), I guess it's better to do what I want to do, and move ahead the way I want to. There might be people who'd dislike that, but I am me, and if there are people cheering me on, I'd like to do my best.